It seems like only yesterday that television match official Graham Hughes was deliberating over whether to award the try that would win Northampton the Premiership title at Rugby HQ. After 100 minutes of gruelling rugby union in front of a packed Twickenham, Alex Waller's score in the final minute of extra-time was eventually allowed to stand and Jim Mallinder's side were left celebrating their maiden league crown. On Friday night, Saints will embark on the defence of their trophy against Gloucester at Kingsholm, hoping to become only the third side to win successive titles in the play-off era. It kicks off an exciting opening weekend of action, which sees last year's Premiership and Heineken Cup runners-up Saracens take on Wasps, before Harlequins play London Irish, in the London double header. Elsewhere, Leicester Tigers, also denied by a late Northampton try in the play-off semi-finals, host Newcastle Falcons, and newly-promoted London Welsh kick off their return to the top flight with a home match against Exeter. With a home World Cup starting in September 2015, this season could take on extra significance for those plying their trade in the Premiership as they look to muscle their way in on the action. BBC Sport has teamed up with BBC local radio and experts for an at-a-glance guide to the campaign ahead. BBC local radio will be providing live commentary of matches throughout the Premiership season, which you can access through the rugby union commentaries page. How have Bath fared in the transfer market? BBC Points West's Damian Derrick: "Most significantly, Bath have the arrival of the hugely-talented Sam Burgess to look forward to. The West Country club's marquee signing from rugby league will certainly make an impact and could add yet another significant dimension. "The recruitment otherwise has been low key and shows the faith head coach Mike Ford has in his players." What are their hopes and ambitions for the new season? "Bath's biggest challenge may well be emulating their performances of 2013-14, with all the other teams now knowing what's coming. They made huge strides last season with new players and a developing style of play which surprised many in the rugby fraternity. "However, they must start their campaign without two key members of a largely dominant pack. Matt Garvey misses the first couple of months, with a recurrence of the ankle injury that saw him miss the end of last season, and Francois Louw doesn't return from South Africa duty until October. "Missing out on a top-four Premiership place and losing the European Challenge Cup final has been Bath's motivation over the summer to make that next step." How have the Chiefs fared in the transfer market? BBC Radio Devon's Nigel Walrond: "The Chiefs have added three internationals to their squad to bolster hopes for the new season, with Scotland prop Moray Low arriving from Glasgow, former England number Thomas Waldrom from Leicester and Namibian full-back Chysander Botha from South African Super 15 franchise the Lions. "Mitch Lees, Tomas Francis, Elvis Taione and Adam Hughes have also been picked up from Championship clubs." What are their hopes and ambitions for the new season? "Exeter are looking to improve on their eighth-place finish last season, and hope the fact they are not in the top tier of European rugby this season will enable them to concentrate on the Premiership and put less pressure on their squad. "One area they need to boost is their home form." How have Gloucester fared in the transfer market? BBC Radio Gloucestershire's Paul Furley: "Gloucester's recruitment for 2014-15 has been impressive, with high-profile signings in John Afoa, Richard Hibbard, Tom Palmer and Mariano Galarza boosting the front five where they were most exposed last season. "The addition of international experience of Greig Laidlaw and James Hook should add class and control at half-back to unleash the Cherry and Whites' outside backs at the right time with quality possession." "Despite all the signings, Gloucester are playing catch-up having sacked Nigel Davies at the end of last season, and taken their time to bring in David Humphreys as director of rugby and Lawrie Fisher as head coach. "How they, plus other new coaches Nick Walshe and John Muggleton, adapt to working with a squad that they inherited from someone else's vision - and how the players adapt to what is asked of them - may prove to be Gloucester's biggest challenge." How have Quins fared in the transfer market? BBC London 94.9's Sara Orchard: "Once again Harlequins have remained quiet in the transfer market as director of rugby Conor O'Shea tinkers rather than transforms his squad. "Only Northampton have made less signings as just two new Quins' faces arrive. England wing Marland Yarde made the short hop from London Irish, while Super 15 wing/centre Asaeli Tikoirotuma arrived from the Chiefs at the end of August." "The 2013-14 season was the first for three years without silverware for the London outfit, but another Premiership top-four finish and reaching the knock-outs of Europe is well within the team's ability. "The announcement of England prop Joe Marler as captain has raised eyebrows across the rugby community but O'Shea's man management has been pretty flawless throughout his tenure in south-west London. The decision to promote the 24-year-old is an exciting prospect for all Premiership fans - who could forget when Marler shaved a sausage company's name into his hair. Whether Chris Robshaw being relieved of the skipper's duties is right for him, his club and his country, won't be known until next year." How have Tigers fared in the transfer market? BBC Radio Leicester's Martin Ballard: "Leicester director of rugby Richard Cockerill has been busy. Out go Toby Flood (Toulouse) George Chuter (retired), Thomas Waldrom (Exeter), Dan Bowden (Auckland Blues) and Steve Mafi (Western Force), along with a number of young developing players. In come a selection of experienced internationals, while Freddie Burns takes Flood's place. "There are a number of former Treviso players; Leonardo Ghiraldini, Michele Rizzo, Robert Barbieri and Christian Loamanu. Add to that Seremaia Bai, Laurence Pearce and the latest recruit, All-Black legend Brad Thorn." "After nine consecutive Premiership finals, the Tigers didn't make a single final last season - let alone win a trophy. So, their aspirations are to put that right at a club where the heritage is steeped in success and expectations are high. "Cockerill has also recruited the Australian Rugby League legend Phil Blake as their new defence coach to correct an area of their game which was regarded as a weakness last season. "The Tigers are a top-four team and they would expect to qualify for the Premiership semi-finals again. It will be very competitive at the top of the table again, but I think the top two will be between Saracens, Tigers and Saints." How have London Irish fared in the transfer market? BBC Radio Berkshire's Chris Egerton: "London Irish were desperately short of power and depth up front last season which is reflected in the summer arrivals. International props in the form of Ireland's Tom Court (Ulster) and Scotland's Geoff Cross (Edinburgh) may prove to be their shrewdest signings. "But the loss of England wing Marland Yarde to Harlequins is bound to hurt. James O'Connor's departure to Toulon less so." "There's more of a feel-good factor at London Irish. With new owners on board and a new training complex up and running, the Exiles could be more competitive this year. "How much they improve compared to Exeter, Gloucester, Wasps and Sale is hard to predict, but Irish hopes of Champions Cup qualification are not without foundation." How have London Welsh fared in the transfer market? BBC Sport's Nabil Hassan: "Championship play-off winners London Welsh have made 25 new signings for their return to the top flight. Yes, that's right, 25. Among them are New Zealand's former World Cup winning scrum-half Piri Weepu and ex-England outside half Olly Barkley. "Australian back-row forward Lachlan McCaffrey and Argentina prop Pablo Henn are another two new signings who will help strengthen the pack." What are their hopes and ambitions for the new season? "Having been relegated two seasons ago, privately London Welsh will be delighted with avoiding relegation this campaign, but publicly they are setting their sights a lot higher. "'We want to do ourselves proud, we're not here only to survive,' Welsh head coach Justin Burnell told me last week." How have the Falcons fared in the transfer market? BBC Newcastle's Ian Smith: "The Falcons have been active in bringing new blood to Kingston Park, both on and off the field. "Off the field John Wells moves up to head the coaching staff and Dave Walder has been brought in to share his experience as a top quality fly-half and help create a style of rugby that will hopefully take advantage of the new Kingston Park plastic pitch. "On the field the squad has been bolstered by the addition of 10 players. Current Italian international Josh Furno is the standout signing in the pack but it is the arrival of Tuilagi brothers Alex and Andy that has raised eyebrows and also expectations on Tyneside. Alex is the star attraction having scored 46 Premiership and 15 Heineken Cup tries in his eight seasons in England's top flight, but at 33 years of age and having spent the last two seasons in Japan, the Kingston Park faithful will hope that his body does not give up. "The Falcons squad looks stronger than last year but fly-half is still a concern." "Newcastle's first season back in the Premiership was a success in as much as they did not finish bottom. The run of 16 successive defeats is the worst in Newcastle's history, and everyone involved with the club will have fingers crossed that can be halted. "Last season the poor condition of the Kingston Park pitch was highlighted as a major factor in producing some rather uninspiring rugby, but that problem is no more as a new plastic surface awaits the boots of the new season's protagonists. It will be interesting to see if the pitch benefits the Falcons and their much talked about change of playing style - or enable the opposition to move further away. "Ambitions at Kingston Park will again be survival." How have Saints fared in the transfer market? BBC Radio Northampton's Ian Hunter: "Fly-half Joel Hodgson is one of champions Saints' two signings this summer - the other being back-row Jon Fisher - and director of rugby Jim Mallinder is looking at the former for the nine spot, but I cannot see that improving on Kahn Fotuali'i and Lee Dickson. "Last year was great for young player development. Saints were able to bring players through players including Tom Stephenson, Tom Collins, Will Hooley, James Craig, Mike Haywood, Alex and Ethan Waller and I expect a number of them to push for regular places this season. "Where could they add strength? A world-class right-winger wouldn't go amiss - power, searing pace or both is always difficult to defend against. Jamie Elliot and Ken Pisi are quality players and I'm nit-picking for the best. A concern I do have is an understudy to fly-half Steven Myler. We saw how much Saints missed him last year when he was out." What are their hopes and ambitions for the new season? "They came into last season as the nearly men but they managed to shake that title. Mallinder will not want that to be a one-off. That is why this year is even more important to the future of the club and this group of players. "Another successful season will project Northampton from a good club to a great one, or at least going in that direction. With success comes the ease of retaining and attracting talent on the pitch, and off it the commercial upshot of more lucrative sponsorship deals. 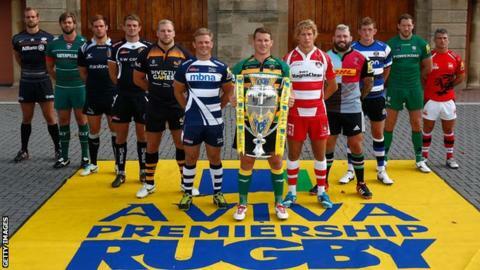 "Mallinder will definitely have one eye on the European Rugby Champions Cup. The Saints have a very good draw and a great shot of throwing their hat in the ring for the final rounds. League and European glory? That might be a bridge too far but Mallinder will be disappointed if he doesn't get one of them. That's his ambition - and mine." How have Sale fared in the transfer market? BBC Radio Manchester's Nathan Middleton: "After losing some of their young English talent over the summer, Steve Diamond has replaced them with proven internationals, with Nathan Hines, Luke McLean and Alberto de Marchi joining. Elsewhere, Chris Cusiter is a more than able replacement for the departing Dwayne Peel at scrum-half and Magnus Lund could be one of the Premiership's most inspired signings." "Sale will be looking to push on from their top-half finish last season and have ambitions of getting into the top four, which they had a sniff at in the closing months of the last campaign. "The Sharks will ultimately be looking to finish sixth or better again but have targeted beating more of the top sides, as well as being competitive in their difficult European Rugby Champions Cup group." How have Sarries fared in the transfer market? BBC London 94.9's Andrew Rowley: "It has been a quieter summer by the standards of recent years at Saracens. Last year's runners-up have bid farewell to some big players, such as Steve Borthwick and Matt Stevens, and will hope Scotland international Jim Hamilton and Argentina's Juan Figallo can step into the breach. "Prop Kieran Longbottom arrives from Western Force and they have also recruited Mike Ellery from England Sevens. The injury to Mako Vunipola is a blow but they have the cover." "Saracens enter every tournament with the ambition to win it, as demonstrated by their final appearances in both the Premiership and Heineken Cup last season. It would be a huge shock if they are not in the mix for both competitions again come May next year. "It will rankle with the leaders at the club that for all the impressive progress on and off the field in the last few years, the 2011-12 Premiership title is still the only trophy to show for all their hard work and investment. "Last season they recorded a record points total in the regular Premiership season and I can see them finishing top of the pile again. Then it is about managing their resources if they are battling on two fronts again." How have Wasps fared in the transfer market? BBC London 94.9's Sara Orchard: "The Wasps HR department have been pretty busy as director of rugby Dai Young sees 13 players depart and 12 arrive. While the loss of Tom Palmer (Gloucester) and Charlie Hayter (England Sevens) will be felt, there's plenty of incoming talent. "The arrival of Sale's James Gaskell could see a formidable second-row partnership built with Joe Launchbury. Keep an eye out for Scotland's Ruaridh Jackson pushing Andy Goode at fly-half, along with Hurricanes Super 15 import Alapati Leiua causing chaos across the backline." "Wasps' potential has never quite been realised in recent seasons because of their ongoing medical bill. "Seeing both Tom Varndell and Christian Wade as regulars on the team sheet should do wonders for the fans' nerves. If they pick up this season where they left off the last - doing the double over Stade Francais to secure the last European Rugby Champions Cup spot - this maturing team will cause problems for others in all competitions. "Dai Young will have been hard pressed to ignore the number of points scored against them in their 2013-14 campaign and no doubt attention will have been paid to tighten up their defence. The announcement of 'The Brand' James Haskell as captain has been hugely popular with the Wasps fans, as the England flanker leads by example on the pitch. He'll be looking to impress for his club to hopefully force the issue of selection for his country, with the 2015 World Cup now in touching distance."